The Refugee Flag was designed by Yara Said, commissioned by Refugee Nation. “Black and orange is a symbol of solidarity with all these brave souls that had to wear life-vests to cross the sea to look for safety in a new country. Since I had worn one, I have a personal engagement with these life-vests and these two colours.” Yara Said. “They come from different countries. They are raised in different cultures. They speak different languages. But one thing still brings them all together: the will of finding a place called home. Refugees are united by one hope. And now, they are also united by one flag. An orange and black flag inspired by the life vests many brothers and sisters had to wear in their search for a safer land to live. 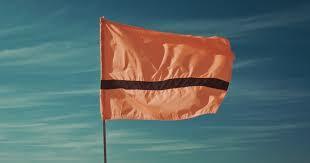 An orange and black flag as a symbol of hope and solidarity. An orange and black flag to bring the world together to support refugees. Because they exist. They are millions. And they matter. While this crisis persists, we’ll be on their side.” The Refugee Nation.